Live on stage in London for a limited 9 week season! After playing to packed houses across the UK, this critically acclaimed Chichester Festival Theatre production comes to London for a limited 9 week season. 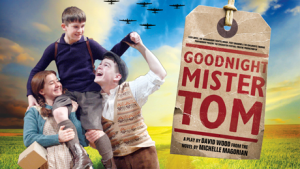 Now a modern classic, Michelle Magorian’s wonderfully uplifting tale is brought gloriously to life in a brand new stage adaptation by David Wood, with Olivier Award-winning actor Oliver Ford Davies starring as Mister Tom. 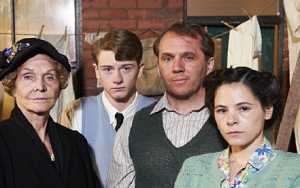 Michelle Magorian is one of Britain’s most popular authors and it is no surprise that some of her finest works have been dramatized on TV. 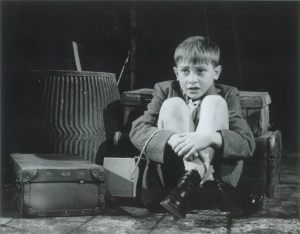 Inspector Morse actor John Thaw was among the stars who brought Goodnight Mr Tom to life in 1998 and on Sunday 18 December, fans of Michelle’s work can see Just Henry on ITV. As with Goodnight Mr Tom, ITV have spared no expense in assembling an all-star line up for Just Henry that includes Sheila Hancock, Dean Andrews and Elaine Cassidy. Michelle very kindly agreed to talk to Best British TV about the book, the show and her other work. As a writer do you feel nervous about allowing someone else to bring your book to life in the form of a TV Show? 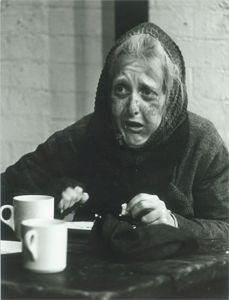 ‘Play as cast’ were the words written on a long term acting contract with a repertory theatre company. I was not only fortunate enough to have been offered these contracts but my work was mostly in theatres that were three and a half weekly rep.
For six days a week these companies would have three weeks to rehearse a new play or musical followed by the technical and dress rehearsals, while giving six evening performances and two matinees of the preceding production. Each month we would be given the cast list for the following play/musical and would be expected to play whatever was thrown at us. Occasionally I was cast as more than one character in the same piece.